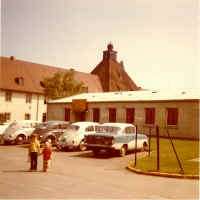 I commanded Delta battery back in 1973-74 when it was at Peden Barracks, Wertheim. We were basic Hawk when I took over. Stood down a few months later and converted to IHAWK. 6/52 was the second BN in 32ndAADCOM to convert. Delta was the first IHAWK battery to pass a 32nd no notice ORE.
Photo taken on Peden Barracks in 1973. Single story building is Delta's Administrative Building. Building housed BC's office, XO's office 1SG's office, Orderly Room, Mail room, and Day Room. Some of our enlisted lived on second floor of two story on left. Most lived in a two story barracks no shown on the right. The children in front are my kids. When I was back in FRG in 1987, we stopped by Peden Barracks and found that my office & 1SG's office were now the PX barber shop. The Day Room was a video rental store. The first BN to convert was ?/? (don't remember their designation for sure seems like it was 2/62) at Bitburg. They had converted about 6 months earlier but had failed to pass a no notice ORE by 32d AADCOM. Since we the first battery in 6/52 to pass our qualification OREs, we were first in the barrel for a No-notice by the 32d ORE Team. We reassumed Hot Status after conversion physically on a Monday and officially on a Wednesday, the 1st of August 1973. The 32d ORE team showed up on Friday two days later. Delta was also the first battery to ever score a zero point loss, superior/superior ORE. Was during the spring of 1974. On a Monday when we were going from training status to back-up status. Were called to Hot status to replace Alpha and to take a 69th Group ORE. Alpha had gone no-op while taking a Gp ORE. Had spent the previous week preparing for ASP. So LT John Monastra, the firing platoon leader, assembled his ASP crew to take the ORE. After the ORE which seemed to go OK, the Group EMO team seemed to take an extremely long time to write-up the results. Finally one of the team told us that we might want to assemble everyone to hear the results. CW4 Frank Silock began by stating the he had never expected to ever award the score Delta had achieved that day, but we had no points assessed against us and the crew drill was rated Superior/Superior. CWO Lew Kim, the 6/52 BN EMO, said we stacked the crew. I said "do I look stupid? This was a Gp ORE." Later I noticed Lew looking at our Tactical Crew duty roster and thought "Oh S----! He is going to be back out here on Wednesday Night." (With four lieutenants I always pulled TCO duty on Wednesday nights. The LTs pulled TCO one weeknight ever week and one day every other weekend, and the Maintenance Warrants did not pull duty officer at all.) Well Wednesday night came went with no BN ORE. But when I arrived at the TAC site on Friday AM I found a BN ORE in progress. Lew and his team had arrived just before crew change to catch my junior LT on duty with the least experienced TCA and a crew that had just completed 24 hours on-duty. When the ORE was over Mr. Kim did not seem too happy with having to give the same score we had gotten on Monday from 69th GP: Zero Superior/Superior. 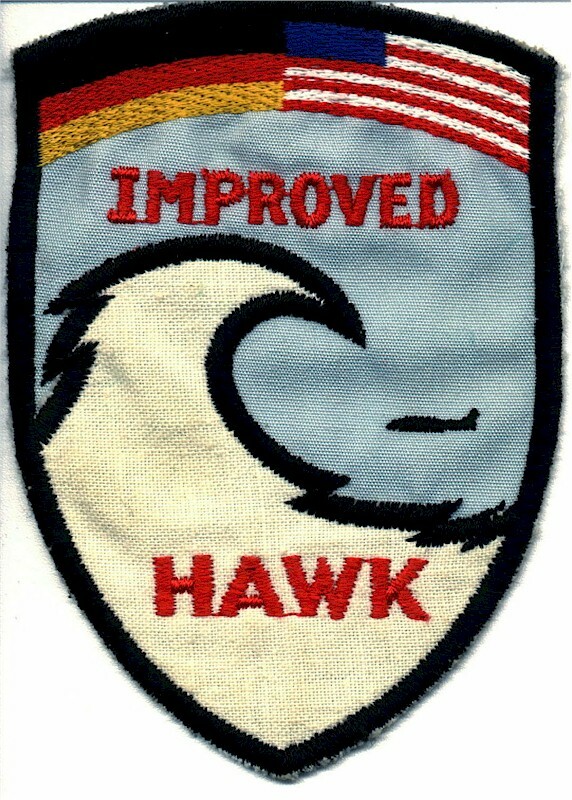 By the way the LT that was TCO that morning was LT John Hettick who was the first 6/52 TCO to qualify on Improved Hawk. I seem to remember hearing that Hettick returned to the Wurtzburg area in the late 1980s as a Major. LT Hettick got to be the first 6/52 TCO to qualify by some bad luck and by my decision. The conversion process ended with a month of intensive training by a team of Raytheon and Army instructors. The Firing Platoon was divided into two crews working 24 on & 24 off. LT Monastra headed one crew and LT Hettick the other. At the end of the training each crew had to pass an ORE given by the 32dAADCOM ORE team in order for the battery to reassume NATO ready status. From what we had heard the first IHAWK BN had had lots of trouble qualifying. We had not lost much training time due to equipment failure, but on the day we had set for LT Monastra's crew to qualify; the ICWAR went down. Prediction was it would be repaired by late evening. So I told the 32d team to come back tomorrow and LT Hettick and crew would take their qualification ORE. Above is the breast pocket patch worn by the 1974 Delta 6/52 ADA Annual Service Practice crew. This was the first ASP for Delta firing an IHAWK. ASP was held that year at Fort Bliss's McGregor Range as there was no IHAWK equipment at Crete yet. We flew commercial from Frankfurt to El Paso and back. Those who wanted to were allowed to take leave after ASP. They only had to pay the cost difference in their plane ticket. Great deal for those that lived on east coast. Seems like we scored about 92.5. Lost points on the IPAR. Kept blowing crystals. Two weeks later when the second 6/52 battery arrived for ASP the radar had been replaced with a new one. As soon as the words were out of my mouth the Battalion Commander, LTC Otto Smith, pulled me aside to tell me the errors of my decision. He wanted Monastra to take the ORE because "he was the best TCO in the BN and the Group and probably all of 32d AADCOM. Why should I trust a 2LT that had only been in the battery for 6 months!!!" I explained that my decision was based on the 24on/24off crew schedule and that I wanted Monastra there to test the ICWAR after DSP got it back to operational. (Also I knew, but didn't tell LTC Smith, that the TCA on Hettick's crew was the best TCA and would keep Hettick from making mistakes.) LTC Smith let my decision stand, but I got the impression that if Hettick didn't pass that Delta would have a new commander. As I expected LT Monastra had thoroughly tested the equipment prior to crew change and Hettick's crew was able to take a few practice drills before the ORE team arrived. LTC Smith paced back and forth in front of the maintenance building giving me dirty looks but was all smiles when the ORE team announce that Hettick and crew were IHAWK qualified. He was smiling even more when LT Monastra and his crew qualified the next day. In case you have not already guessed LT Hettick's nickname among the enlisted men of the battery was LT Headache! Question: When did Delta move from Wertheim to Hardheim? Why? Did they build more high rises blocking our PTL? LT John Monastra told me once that if the balloon went up and we were still on the TAC site at Wertheim, the first missile he fired was going to take off the top two floors of that high rise just to the right of our PTL. Thanks for bring back lots of pleasant and some not so pleasant memories... ...of Lieutenants Sari, Monastra, Neeb, Hettick, and Mulhrony. ...of First Sergeants Rose and Henderson. ...of CWOs Bob Fern and Steve Scott. Of PSG Franco and SSG Bowman. ...of the many hard working enlisted men who made Delta Battery the best in 32d AADCOM. ...and even those few that I gave Article 15s to or Court Martialed or gave bad conduct discharges to. Thanks for creating the Web site.